I could not resist posting this cartoon. It defines what teaching is: creating a process that moves a learner from the left-hand circle to the right-hand circle, nothing more, nothing less. Creating that process efficiently and effectively, however, is of course a completely different question. 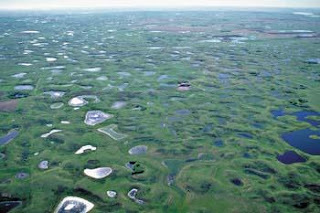 The prairie pothole region, characterized by millions of unique ponds scattered across its surface extends from Alberta Canada, down into the central United States. This “patchy” ecosystem provides feeding habitat for an estimated 50-75% of North Americas breeding ducks, which feed primarily on the numerable invertebrate species found within the area. The region is an ideal site for the study of metacommunity dynamics, as it’s many local ecosystems (ponds) are joined by the dispersal of highly interactive species (ducks and invertebrates). Transport of plant propagules by ducks both internally (endozoochory) and externally (ectozoochory) have been extensively researched by scientists, but the use of such methods of transport by invertebrates is an area of science remaining in it’s infancy. Last semester I did an extensive literature review to determine which invertebrate taxa found within the region have the ability to be successfully transported by ducks. An invert was classified as being successfully transported by internal means if viable eggs or adult forms of the invert were found within the lower digestive tract or excrement of waterfowl. Inverts were classified as being capable of external transport if literature was found containing evidence that the particular invert was observed attached to waterfowl plumage, feet, or bills. Variation in invertebrate species composition among ponds within the prairie pothole region can be attributed to dispersal via diving and dabbling ducks, or – if this isn’t the case, that the differences in invertebrate assemblages among ponds is due to: large-scale environmental characteristics, and the unique ecosystem presented by each pond.